The garden is doing well. I've picked cilantro a handful of times for recipes. 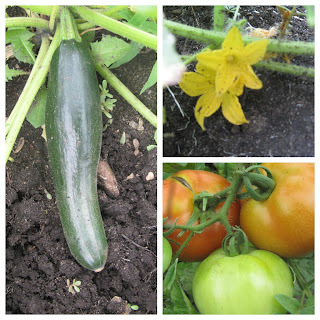 I also picked the first zuchinni the other day, with another ready soon. The last of the peas also were ready this week. The cucumber and squash plants are still blooming. We have at least a dozen large tomatoes and another dozen cherry tomatoes that are slowly ripening. A few of the green bean plants are still blooming. The rest only produced about a handful of beans together. Thankfully our wonderful neighbor has brought me 3 bags of beans over the past few weeks. She mentioned she's canned over 60 quarts of green beans and asked if I minded taking some. Well, yes of course!